After sampling the fabulous Vietnamese rolls at Fernandez and Leluu’s supper club, I’ve gone a bit summer roll mad. This was encouraged by creating a lunch for someone who’s severely alergic to gluten, all dairy, and can’t eat much fat. After wracking my brain for hours the my mind wandered back to those fabulous summer rolls. And so I set about gathering the ingredients. Rice papers I had, and a couple of chicken drumsticks and wings I could poach. Prawns? Check. Erm… basil, mint and coriander? Yup – I had those, but crucially the western versions, not the more aromatic, gentle and citrussy kinds found in SE Asia and on Mare St. Oh well. Peanuts? Nope, but I did have peanut butter. What I discovered, to my joy, was that summer rolls can house pretty much anything. The main requirement is that they are fresh and light, with a careful balance of flavours. The slightly glutinous rice paper binds them all together texturally as well as physically, providing a slightly chewy background. With them I had the sesame squash which I blogged about here, using sweet potato instead of pumpkin, and some peppery watercress. The combo of peppery, sweet and fresh flavours worked a treat. This was my first proper home-cooked spring meal of 2010. Lovely. 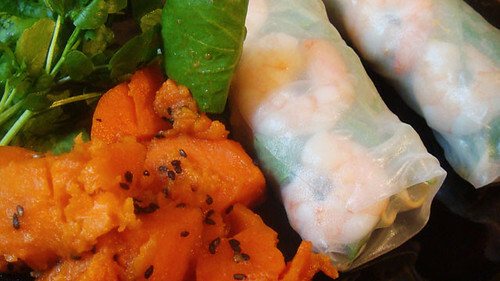 The beauty of summer rolls is that you can put almost anything in there. The most important ingredients to my mind are the fresh herbs and prawns. Get anything that goes with these and you’re sorted. Traditionally (I think, please feel free to enlighten me though) they would have rice vermicelli inside, but I prefer the added crunch of the beansprouts. For the best, most delicately fresh and wonderful flavour, do try and get hold of Vietnamese mint and Thai basil. They are both softer and more fragrant than their western equivalents. The mint in particular is a delight. It is softly citrussy and almost sweet. I also serve it chopped with fresh and uber-ripe alphonso mango. Rapture. Also, lightly roasted and ground fresh peanuts are better than my peanut sauce, with sweet chilli then served as a dip. But if you want something pungently punchy, a smack in the chops rather than a light tap, do go for the sauce. Poach the chicken in enough water to cover it with the unpeeled and quartered ginger and onion. This takes about 40 minutes to an hour. Let it cool, remove and shred the flesh. Mix the peanut butter, sweet chilli, oil, hot chilli and soy sauce into a thick spread. Adjust the soy and hot chilli to taste. I like mine quite pungent, hot and spicy. Wash and strip the basil and mint leaves from their stems. Assemble the herbs, the shredded chicken, the peanut sauce, prawns and beansprouts in bowls around a wide plate. You need to get a production line going now. Fill a wide frying pan with cold water and soak the first of the rice papers in it for a couple of minutes until it’s super soft. Take it out and spread it out on the plate, careful not to rip it. As soon as it is on the plate, put the next paper into soak. Lay four of the prawn halves down in a row, about half way up the paper. Layer basil leaves, beansprouts, mint leaves, chicken, coriander and peanut sauce on top of one another. Be careful not to put too much on, you’d be surprised how big it can be. Fold the bottom half of the paper over, then fold each side in and over the centre. Pull the ingrediants tightly into the paper and roll it up. The end will glue itself down. Now put it on a plate and be careful not to let any other rolls touch it for a minute or two. Repeat the process with the other seven papers. If you want to store some overnight to take for lunch the next day (and excite envy at work) lay them on a damp kitchen towel, cover with cling film and store in the fridge. @meemalee and @maninas thank guys! I am very impressed, you seemed to have mastered the folding of the rolls to a T. Mine don’t look anything like yours! I am so greedy I always overfill them. Well done. Oooh, taking them for lunch the next day! I never thought they’d last, but that’s a GREAT idea! @The London Foodie – thanks I enjoy the folding – i reckon the trick is to not be too gentle when tightening and rolling, and at the same time being careful not to rip them. @Lindsay – i think putting them on a damp kitchen towel in the fridge overnight really helps, it keeps the wrappers moist. Ahh – I am so behind with my blog reading! Love summer rolls and glad you did your variation which sounds great! Would have loved to taste them.. Please make them again! : ) for us.. The peanut butter thing is mighty inspiring – I think I must try it out on a sauce for summer rolls as traditionally in Vietnam, the sauce always has peanuts in it. The one you had when you came over is a variation of summer roll from a Vietnam beach city called Phan Thiet – they are the only ones who put mint in their summer rolls. Also they put in fish cakes in it. I am not sure if all Vietnamese people are like my family, but they are incredibly strict about what goes into what – like what goes into summer rolls. It was already mortal sin I had committed to my mother for putting into the summer rolls some cured ham, instead of fish cakes. Anyway, should do a blog post about summer rolls too – no one really eats them like they make them here in Pho Mile – which is the cheap, tasteless version for good profit. PS – great tip for greedy ones like me – use a sushi mat to roll. The peanut butter was born out of improvisatory necessity really – i needed something, and we’d had a fantastic peanut satay sauce at Rosa’s Thai on the weekend. So I just kind of improvised. Next time I wouldn’t put in dark soy because it made it almost too intense for the roll. Thanks for the info on the Phan Thuiet summer roll – it’s now my bench mark, and the only one I’ve had that matches up to (and mostly surpasses) those we ate in Hanoi and Ha Long. And good idea re the sushi mat – i’ll try that out next time!